Our genes come in pairs, one from each parent. A carrier of a recessive disease is an individual who has a mutation in one copy of a particular gene that causes the gene not to function properly. Since carriers have a second working copy of the gene, they generally do not develop any symptoms of the disease, but they can pass on the gene with a mutation to their children. Autosomal recessive diseases are those that develop when both parents are carriers of the same condition and they both pass on their mutations to their child. Many diseases that are common in the Jewish population are inherited in an autosomal recessive pattern. 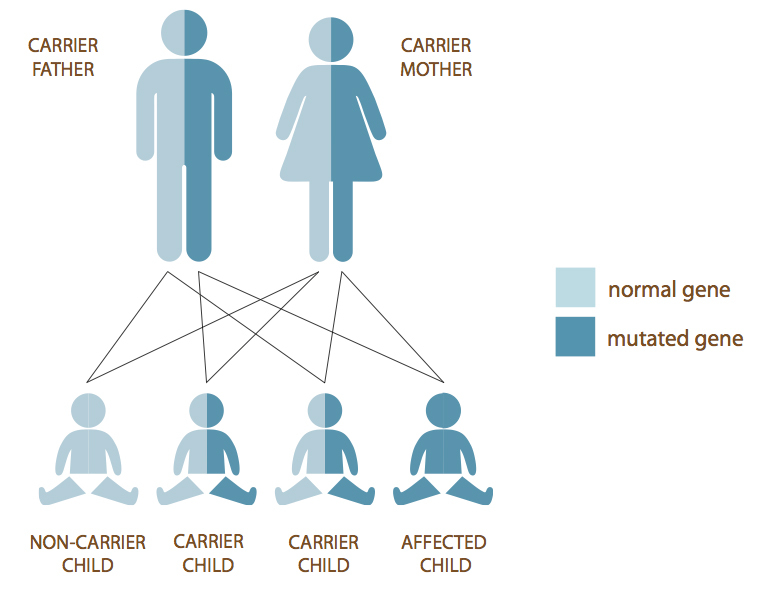 While carrier screening generally identifies carriers of recessive diseases, some individuals may discover, during the course of carrier screening, that they themselves have two mutations and are at-risk for one of the less severe or late-onset diseases on the testing panel. It is important that results be discussed with a genetic counselor. While testing for ancestry and predisposition to certain diseases does involve genetic testing, carrier screening for recessive diseases is not the same. It is important that you speak with someone knowledgeable in genetics to learn the difference and become aware of what kind of information you may learn from any form of genetic testing before proceeding. You may learn a lot about family and your own health risks that you did not expect. You may have heard that Ashkenazi Jews are more likely than others to have mutations in the BRCA gene, which could predispose carriers to certain cancers. Reproductive carrier screening will not tell you about your BRCA status. If you have a personal or family history of cancer, or if you would like to have BRCA testing for another reason, a consultation with a genetic counselor is recommended beforehand. Everyone considering having children should be screened. While many diseases are more commonly found in certain ethnic groups, there is still a chance that an individual from a different background might be a carrier, as well. At least one member of every couple should be screened. If his or her results are positive, the other member of the couple should then be screened. Some couples decide to be screened simultaneously, as to avoid the waiting between results especially if they are already pregnant. There may be some diseases on the testing panel for which only females are screened. Therefore, if one partner is tested first, it is recommended that the female be first. Carrier screening for all of the Jewish genetic diseases by DNA analysis can be done using blood or saliva. For Tay-Sachs disease screening, enzyme analysis using blood, in addition to DNA analysis, is required. All genetic tests should be ordered and the results read by a knowledgeable physician or genetic counselor trained to interpret such results. Pre-test education and post-test counseling are recommended with any form of genetic testing. Please be aware that not all genetic testing companies provide these services. Diseases are often added to panels, so be sure testing is up-to-date before any pregnancy. Individuals should always request a copy of their results, which should be kept it in a safe location. Cost and insurance coverage depend on which lab or genetics program you are using. Some have set out-of-pocket prices and may bill your insurance, some provide free testing at on-site events, and others will bill your insurance and charge you the balance. Medical genetics programs can be helpful in determining coverage. Please note that some labs offer financial assistance programs for eligible individuals. The JGDC may be able to help identify resources for carrier screening for those who do not have insurance or need assistance with coverage. Please contact the JGDC at info@jewishgeneticdiseases.org for more information. Currently there are several places to obtain screening: a hospital or clinic-based medical genetics program, an online genetics program that offers education, counseling and screening, or your physician’s office. For assistance in seeking a genetic counselor, visit NSGC. In addition, the JGDC provides a list of screening resources. Screening before pregnancy is optimal. This allows carrier couples the greatest number of reproductive options. Diseases are often added to testing panels, so be sure testing is up-to-date before any pregnancy. There are multiple reproductive options that enable carrier couples to build a healthy family. Each couple needs to make their own informed decision, based on the disease or diseases for which they are carriers, and other personal considerations. Genetic counselors can explain options in depth. To undergo In-vitro fertilization (IVF) with pre-implantation genetic diagnosis (PGD). In this procedure, the egg is fertilized outside the body and embryos are tested at a very early stage for the disease(s) carried by the parents. Only unaffected embryos are implanted in the womb.